CALL US NOW IF YOU ARE HAVING ISSUES WITH YOUR JENN-AIR REFRIGERATOR! We are open 24/7. If you have a Jenn–Air refrigerator and it is starting to have problems, you should act quickly – it’s impossible to know whether these early symptoms will remain a mere inconvenience or transform into something much bigger that might require you to replace your refrigerator completely. That’s why it is important to call All Time Services as soon as you suspect that your Jenn–Air refrigerator is having problems. 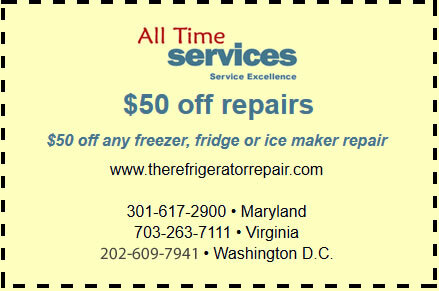 We’ve been repairing Jenn–Air refrigerators in the greater Washington D.C. area for years, so you can rest assured we’ll have it fixed and functioning as it should in no time. Of course you’ll need to know there’s a problem before you call for service for your Jenn–Air refrigerator. Much of the time, these symptoms can be easy to miss. Things like a little bit of condensation on the outside of the refrigerator or a bit of extra frost inside the freezer compartment may seem like relatively normal things, but, they are almost always symptoms of bigger problems that, if fixed quickly enough, can prevent more expensive repairs down the road. One of the biggest problems you are likely to encounter is a loss of cooling capacity in your Jenn–Air refrigerator. This can happen for one of a couple reasons. Most commonly, there is a problem with the compressor or motor. However, there could also be a malfunction in the thermostat (though thermostat problems typically tend to result in excess cooling) or the seal on your fridge door may need repair. Another sign that you have a problem is if the compressor never turns off. Like any appliance, it shouldn’t need to run nonstop to do its job – if it does, there could be a problem with the door seal or the compressor itself. Leaks and excess freezing are both big problems as well. Ineffective door seals, broken defrost timers or leaky drip pans can all lead to leaks or freezing – all of which should be repaired immediately. If you notice a leak, excess noise, excess cold or ineffective cooling in your refrigerator, don’t wait. 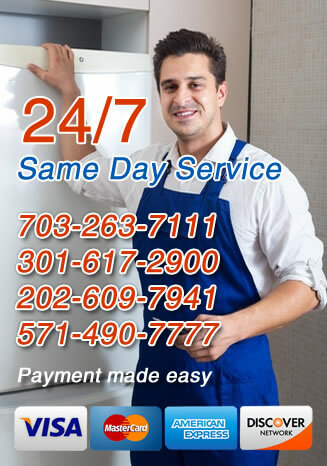 Call All Time Services right away for Jenn Air Refrigerator Repair Service in Virginia,Washington DC and Maryland. Almost any problem, no matter how big it is, can be fixed without needing to replace the refrigerator if you catch it early. However, the longer you wait, the greater the chance more significant damage will be done to your Jenn–Air fridge. Fortunately for those living in Arlington, VA, Gaithersburg, MD and the surrounding areas, we’re always only a phone call away.